Working at the office with hectic schedules and deadlines, stress-eating, and unhealthy coworkers can be stressful, but it’s not only these factors. The long hours and sedentary nature of your office desk job is also taking the life out of you – in a more literal sense. 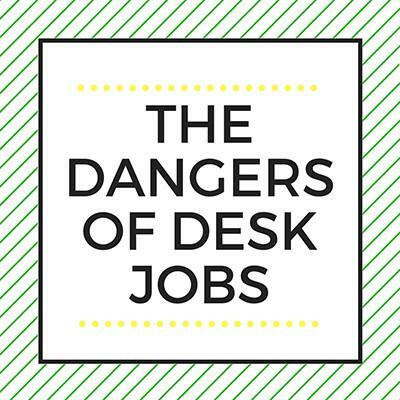 These are the the dangers of desk jobs that you should look out for. We cannot stress enough that sitting all day and having a sedentary lifestyle will bring no good to your health. However, sitting all day is something that you do all day when you have a desk job, which is why sitting all day made it to our list of the dangers of desk jobs. More than 85% of workers in the United States sit at work. If you belong to that 85%, it is suggested that you change your position every eight minutes and take a “moving break” (move around for at least two minutes) at least twice an hour. Are you the type of person who skips breakfast every day and opts for unhealthy fast food meals for lunch? Then you are not doing your body any good. Skipping breakfast all the time puts your body in a very stressful state, and it can disturb your metabolism. Thus, you will become more prone to becoming overweight, heart issues, and high blood pressure. In addition, a portion of a fast food meal, more often than not, has twice the amount of calories than a healthy lunch. In addition, it also comes with a lot of oxidized fat, which can lead to major illnesses, including heart-related diseases. Most of us commute to work. However, studies suggest that those who commute more than 10 miles by car are more prone to higher blood sugar and increased cholesterol. This is according to the study conducted by the University School of Medicine in St. Louis and the Cooper Institute in Dallas, Texas. The studies also suggest that commuting that long can also double the risk of depression, misery, and general anxiety. But if you think that public transit is healthier, think again. Another study in the United Kingdom shows that people who commute 30 minutes by bus have the lowest levels of satisfaction in life. In fact, even cyclists are not spared to the dangers that long-distance travel bring. These are just some of the dangers that having a desk job brings. Always remember that when you work in a sedentary environment, your health should always come first.